Ring-and-pulley drive (Fig. 10). A thick steel ring in this drive encircles two variable-pitch (actually variable-width) pulleys. A novel gear-and-linkage system simultaneously changes the width of both pulleys (see Fig. 10B). For example, when the top pulley opens, the sides of the bottom pulley close up. This reduces the effective pitch diameter of the top pulley and increases that of the bottom pulley, thus varying the output speed. Normally, the ring engages the pul­leys at points A and B. However, under load, the driven pulley resists rotation and the contact point moves from B to D because of the very small elastic defor­mation of the ring. The original circular shape of the ring is changed to a slightly oval form, and the distance between points of contact decreases. This wedges the ring between the pulley cones and increases the contact pressure between ring and pulleys in proportion to the load applied, so that constant horsepower at all speeds is obtained. The drive is avail­able with up to 3-hp capacity; speed variations can be 16:1, with a practical range of about 8:1. 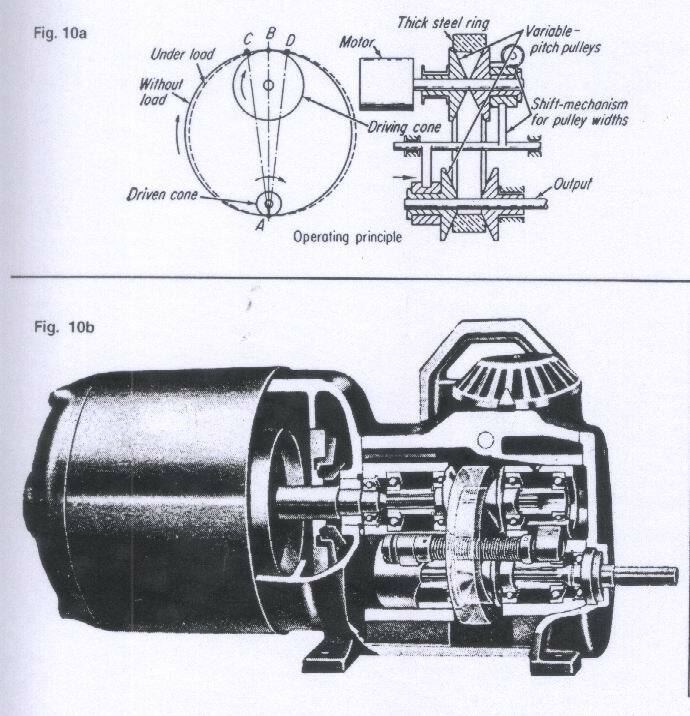 Mechanism and Mechanical Devices Sourcebook. Second edition, 1996. Author : Nicholas P Chironis & Neil Sclater. Published by McGraw-Hill, New York, USA.